The search for Jonathan (Luke Baines) is momentarily paused as characters deal with the the massacre of Heidi's (Tessa Mossey) vampires on the pack. Unable to explain the supernatural circumstances to the police, Luke (Isaiah Mustafa) prepares to take the fall for the crime feeling guilty what happened on his watch. Maia (Alisha Wainwright) struggles with being the sole survivor (and plans her revenge) while Heidi sicks the Shadowhunters on her clan, denying any responsibility or involvement in the attack (while playing both sides against each other to increase her power and stature among the vampires). Although Heidi's plan succeeds, Maia finds a way to outsmart the vampire though her choice of vengeance doesn't sit well with Simon (Alberto Rosende). After a short build-up, Heidi's quick demise comes as a bit of a surprise although her actions, and demise, do force characters to consider the Accords and the laws they live by. In other stories, Isabelle (Emeraude Toubia) is sent to Detroit to bring in Rafael (David Castro) whose recent actions Heidi is all to eager to let Alec (Matthew Daddario) know about, Alec and Magnus (Harry Shum Jr.) go through some growing pains after the warlock moves in, and Clary (Katherine McNamara) loses control when a sparring session with Aline (Jacky Lai) gets physical. Isabelle's story gets truncated the most for time, which is too bad given how much emotion is wrapped up in such a small plot thread. 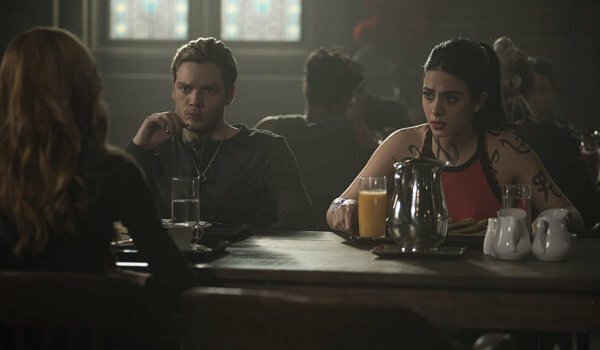 Clary's connection to her brother continues to grow as she exhibits some of his bloodlust (making me wonder if Jonathan may be feeling a bit of his sister's compassion?). One thing is clear, Clary's role in appreheding her brother is in question as is the fate of Magnus whose minor issues throughout the episode prove much more serious as the episode draws to a close.